Located in Maojiaping village, Pan’an town, Gangu county, Maojiaping site is 25 miles east of the county town proper, and situates itself at the second terrace of the southern Wei River, Gansu Province. The site measures about 500 to 600 meters from east to west, 1000 meters from south to west, and covers an area of 500,000 to 600,000 square meters in total. It is divided into an east section and west section by means of a natural ditch. The western section’s north and west areas were residential areas, while the southern part was a burial area. The eastern section was, however, largely taken up by burial area alone. The Maojiaping site has been excavated twice before, and its tombs are believed to belong to the Qin State of the West Zhou Dynasty. Its residential areas have also been identified as belonging to the Qin culture of the same period. Thanks to this excavation, we know that the chronology of Qin Culture actually began during the Western Zhou Dynasty. This represents a breakthrough in the archaeological studies of the early Qin Culture, and is also something of a landmark in academic history as a whole. 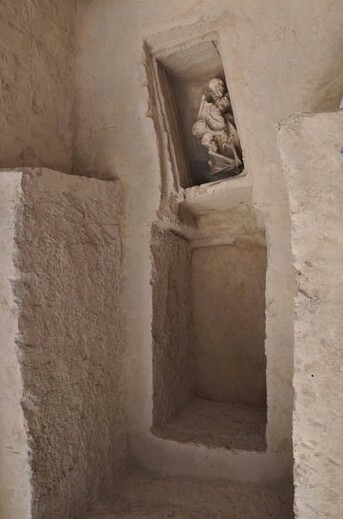 In 2012, Maojiaping site was surveyed and excavated by an archaeological team on the early Qin Culture, comprised of early Qin specialists, jointly organized by Gansu Institute of Cultural Relics and Archaeology, Shaanxi Institute of Archaeology, The National Museum of China’s Department of Archaeology, Peking University’s School of Archaeology and Museology, and Northwest University’s School of Cultural Heritage. In all, 288,000 square meters were drilled and 731 tombs of various kinds were found. Three locations (A, B, and C) were targeted and excavated. Location A and location C were both on the north of the residential area, situated on the western side of the natural ditch that divides the site into two. Their excavation areas were 150 square meters and 100 square meters respectively. Location A: Excavation began here in July 24th, 2012, and lasted for more than 4 months. In that time over 140 ash pits were excavated, dating to the Spring Autumn Period, the Warring States Period, and the Western Zhou Dynasty in general. Four earthen-pit tombs were found, among which 2 dated back to the Spring Autumn Period and 2 to the Western Zhou Dynasty. A large amount of cord-pattern grey pottery fragment was found, falling into the categories of Li tripods, often used during rituals, and Dou plates, alongside other bowls and jars. All of these dated to the Qin Culture of the Eastern Zhou Dynasty. Sand-tempered reddish brown ware such as spade-footed Li tripods, and double-handed jars, were also unearthed in some ash pits, dating to the Western Rong Culture of the Eastern Zhou Dynasty. Particularly noteworthy was the discovery of a trampled-layer of earth (No. L1), between 30cm to 50cm, from the Warring States Period, which was evidence that the site used to be a small square for hosting public events by the residents nearby. Location C: Around 70 ash pits were found here, some of which dated back to the Eastern Zhou Dynasty, and some to the Western Zhou Dynasty. 3 earthen-pit tombs were excavated, all of which were of the Spring Autumn Period. A large amount of cord pattern grey pottery, dating back to the Qin culture, was also found. Location B was located in the burial area of the eastern part of the ditch. 21 tombs and 2 horse-and-chariot pits were excavated. It covered an area of 250 square meters. Of the 21 tombs, 11 were dated back to the Warring States Period, and the remaining 10 to the Spring Autumn Period. 5 catacombs and 16 earthen shaft pit tombs were found. With one exception, all shaft pit tombs were no more than 3 meters long. The dead were all in flexed positions and facing west, demonstrating a typical burial custom of the Qin people. Among various bronze-ware excavated, Ge dagger-axes, arrowheads, plaques, paring knives, buckles and other types were included. Various kinds of pottery were also discovered, such as Li tripods, Ding tripod, Dou stemmed-plates, Hu bottles, jar, and other differing forms. Also included were turquoise, charcoal pigment, crystal beads, stone tablets, jade rings and other funerary accessories. Each of the two horse-and-chariot pits contained one chariot and two horses, all buried facing the east. Horses were placed on the riding spot of either side of the thill, were killed, and then set to kneel. Clear components can be seen, such as the lateral beam, yoke, thill, wheel, wheel hub, and wheel shaft of the double-wheeled, single-shaft chariot. Sacrificial dogs and human bodies were found in Pit K1001. A spear was placed over the lateral beam in Pit K1002, which probably belonged to the chariot. As these horse-and-chariot pits of the Zhou Dynasty are the first discovery in Gangu County, they are obviously of significant value. This 2012 survey and excavation confirmed the boundary and extent of the site, which covers an area of over 600,000 square meters, and includes a total of some 1,000 tombs, making this a site of unprecedented scale in the whole of Gangu County. The artifacts found in the Maojiaping site are largely thought to be from the Qin Culture of the Zhou Dynasty, and should be dated back to around the times of the Western Zhou and Warring States Period. The date, location and size of the Maojiaping site indicate that it was probably the city of the Ji County established by Duke Wugong of the Qin State. Being that this site is situated on what was then the gateway to the west, it is extremely important to those studying the history of the early Qin Dynasty, and the time and route of their westward migration.